The Alcatel One Touch OT-510A an easy to use candybar style mobile phone with an 1.8″ color display, GPS and web browser. Lightweight and small, this device is great for users who love to call and text. 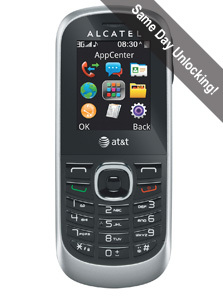 Unlocking your Alcatel One Touch OT-510A is quick, easy and 100% guaranteed by Cellunlocker.net. Unlock your Alcatel with us today and get your unlock code on the same day! Why Unlock your Alcatel Phone with Cellunlocker.net? * Simply enter the Sim Pin or Unlock Code we e-mail you and that’s it! * There is absolutely no risk of damaging your Alcatel phone by unlocking it.